In My Mailbox is hosted by Kristi, The Story Siren, you probably already know that but if you don’t, go here and find out more!! This is my Christmas mailbox really as I didnt post one last week. 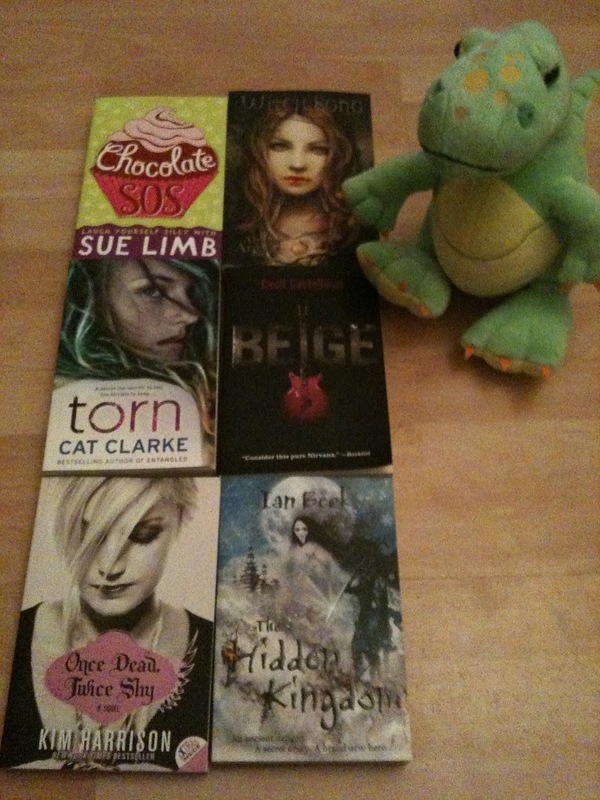 I got a couple of books as gifts and then I got an amazon gift voucher so yay!! This was sent through from Bloomsbury for review, Im not sure its really my kind of thing as it may be a little too young but Im gunna give it a go!! Thanks bloomsbury! My sister got me both of these for Christmas and I cant wait to read either, I loved the sound of The Hidden Kingdom when I saw it reviewed on a blog a few weeks ago and I cant believe its one she picked! She has great tastes! My mother in law tried to buy me debenhams or next vouchers… then my wonderful OH told her not to bother and get me amazon vouchers instead… Im so glad he knows me so well! hehe so yeah, I had to cancel my pre-order of Torn because of Christmas and I was terribly sad about it so I got it with the voucher instead! yey! I also managed to get a copy of Witch Song for £1.67!!! I love the amazon marketplace, its meant to be £12 new and this copy is perfect, no marks or anything!!! Torn is absolutely brilliant. I hope you enjoy it as much as I did! I really want to read Torn. I can’t believe that you got Witch Song so cheaply, I’ve been eying that one for ages! I’m off to Amazon to look it up now! I managed to spend a bit more than I should have on Amazon over the past few days. It’s still the festive season so it’s not real money, right? Hope you enjoy these, Raimy, and Happy New Year! Fantastic IMM, you have some really cool books in there!!! Brilliant mailbox!! Loving the look of these books, some I haven’t seen before too!